If you read my blog you will know that I am a huge fan of educational toys and the idea of learning through play. Great Gizmos are a site that provide just that. Established in 1997, Great Gizmos stock an extensive range of high quality educational and creative toys for kids of all ages, their ultimate aim is to make learning fun. I was recently sent an impressive parcel of goodies from Great Gizmos to look at the exact kind of products that they sell. I didn't know what I would be receiving so it was a lovely surprise. Inside were products from NICI, 4M, Plan toys and Lil Pet Pals. The first item that Great Gizmos sent me was the NICI Owl Backpack. This adorable bag has a RRP of £24.99 and comes complete with fluffy wings and stripy feet stitched on the outside. Suitable for boys and girls, it is a perfect size for younger children to take to playschool with them. I managed to fit in a jumper, a top, a pair of trousers, underwear and a hat and there was still room for more. With the option of a carry handle of back straps, the backpack is both fun for the child and it is also extremely practical as the design encourages your child to carry their own bag. Gracie took to wearing it around the house, I think the owl became her new friend. The second item to come from Great Gizmos was the Dragon Bag from Lil Pet Pals. This bag has a RRP of £13.95 and is actually a lunch bag in disguise. Inside it is fully insulated to keep food and drink either hot or cold. With its bright colours and and added sticking out ears, the design is simple yet extremely effective. It even comes complete with a name tag inside, so need to worry if someone happens to have the same lunch bag. As you can see from the pictures above, Layla claimed it as her own, the small carry handle at the top made it easy for her to carry. The bag is well made and I think because it has wipe clean material, it would last a long time making it great value for money. A quirky item that may help if you have a child that doesn't like the idea of staying out for lunch. The third item we received from Great Gizmos was the Beehives game from Plan toys. Now I am a huge fan of wooden toys and I have to say this game didn't disappoint. This game has a RRP of £23.96 and although it says it is suitable for 3 years +, it proved popular with all of my children. The set includes 6 beehives, 6 bees and a pair of tweezers. The bright colours of the bees and their hives draw you in and each of my children had different ideas of what to do with them. Layla was keen on trying to "help" her sisters play. Gracie who is three worked out quite quickly all the different things she could do, matching up the bees with the same coloured hives, stacking up the hives into towers. My 5 year old Freya enjoyed making different patterns with the hives and my 8 year old Elise was mixing the colours, for instance she told me when she put the blue bee in the green hive it would make yellow. A really great educational toy that teaches a new lesson each time you play with it. 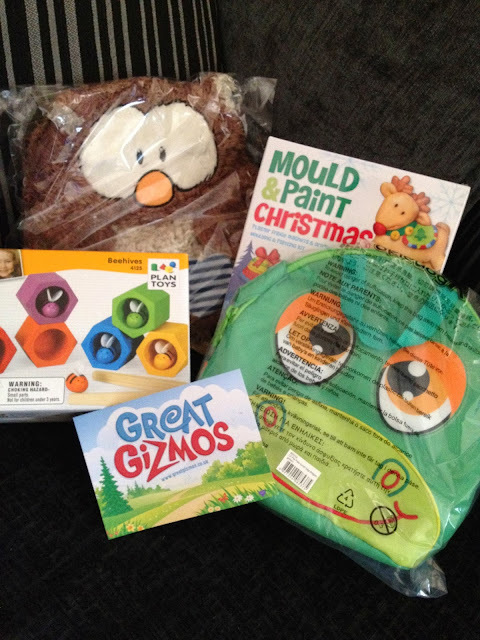 I think we saved the best till last, item number that Great Gizmos kindly sent to us was the Christmas Mould and Paint Kit from 4M, just perfect for this time of year. With a RRP of £8.95, this kit comes complete with mould, plaster, paint, brush, string and magnets. We had the chance to make some festive decorations and magnets. The plaster was simple to mix and once put in the moulds, only took half hour to set. The girls took it in turns to paint their chosen festive characters, you can see from the picture above the final creations. There is enough plaster to make 12 different moulds. The string needed to be placed in the plaster before it dried but stayed in place nicely one the plaster had set. The only negative thing we found was that the magnets wouldn't stick to the back of the plaster, we ended up getting Daddy Hazelden to superglue them on but overall the kids were very pleased with what they had made and they have decided to give their creations to their teachers as Christmas presents. I have shown you just a tiny selection of products that Great Gizmos have to offer, why not pop over and take a look for yourself, you may just find some products perfect for those Christmas presents that you need to buy. Disclaimer : These products were sent to us free of charge for reviewing purposes however all thoughts and opinions are my own.